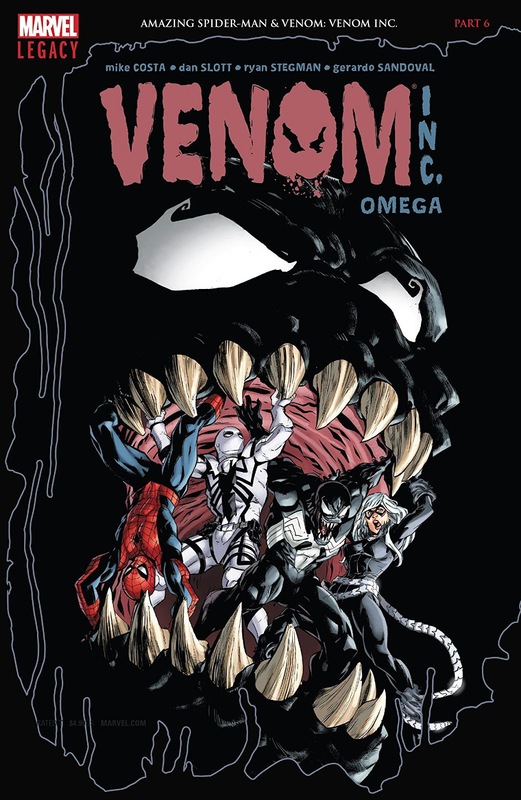 Venom Inc concludes its crossover between Amazing Spider-Man and Venom, and I for one couldn't be happier, I want the regularly scheduled programming back. This mini series basically has sidelined the progress that was being made in both series, for a random symbiote related storyline, that isn't very necessary. Anyway let's see how things wrap up here in this final Battle Royale since I’ve invested all this time and money anyway. This issue starts by picking up from last issues cliffhanger, with all the Symbiote goo spit out by Maniac returning to him, after taking control of the five families didn’t work out. Looking over the page, this is the point I was pretty much out altogether on this crossover, unfortunately that’s on page 1 of this issue. 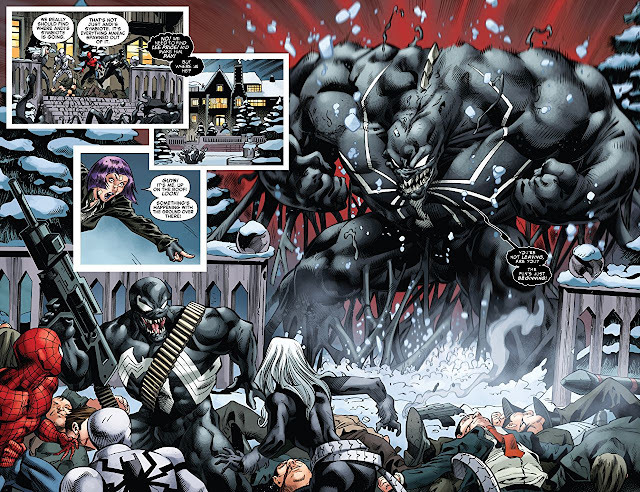 By making Lee a gigantic huge Kiju version of the bad Venom he was previously, for reasons I don't totally understand, takes the story from a dramatic thing with a bit of fun mixed in, to a full blown Disney XD Saturday morning cartoon. Because of Maniac’s pure size advantage even Anti-Venom (Flash) has no effort on him at the start here, really putting our heroes in a bad spot as Flash is flung aside. Everyone from here basically takes their turn chewing up the page count while taking their best shot at Maniac for a large chunk of this story. ‘Hellfire’ (Andi) ends up having the most luck using her “fire” powers, since its an obvious weakness of the creature, and she appears to be powerful as all hell. Spider-Man at one point gives, the down and out Flash, a quick pep talk, bringing him back into the battle, just as he also suddenly remembers he has a healing factor ... you know something heroes forget a lot of the time. See what I mean about the cheese in this story, its just comes off silly. Meanwhile Black Cat gives her best effort to take down Maniac, which results in Spidey jumping back into the fray, as he saves Black Cat from being stomped into oblivion. By the end this arc, these actions seem to put the two characters back on better terms, possibly the one development I enjoyed in this crossover, besides Flash becoming Anti-Venom and getting some powers back himself. Back to the story, Flash, back at it again, teams up with the others trying to use a little group effort this time to finally make an affect on Maniac. As Spidey gets flung aside once again, things suddenly start to make sense to him. With an assist from Black Cat, he comes up with the bright idea of doing the old bloody handshake trick with Flash, to upgrade Anti-Venom. 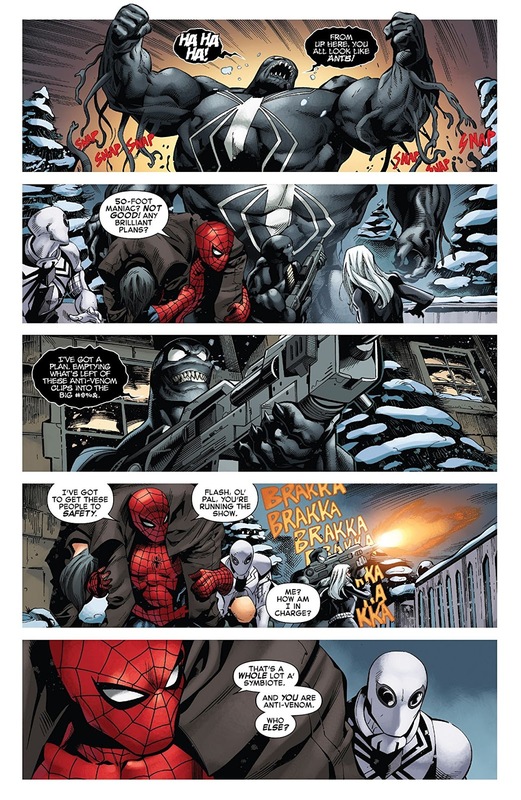 This all spawned from the fact Black Cat, and Spidey himself, couldn’t be mind controlled by Maniac twice, because apparently you build up an immunity to the Venom Spit once it’s ripped off the first time ... so Spidey will use his blood as an antibody to defeat Maniac is his theory … GROSS!!! A now conveniently upgraded Anti-Venom basically ‘spikes out’, using his newfound anti strength, to take down Maniac as the symbiote explodes into a million pieces. The issue concludes with everyone who teamed up; Venom, Spidey, Anti-Venom Flash, and Black Cat all building a stronger mutual respect for each other as actual heroes, even the ones who were previously at each other's throats. So scorecard of our final developments after six issues: Flash Thompson is apparently now Anti-Venom, Andi is no longer Manic and is now HellFire again without a symbiote, Black Cat is no longer running things as mob boss and is on good terms with Spidey, Maniac may or maynot still have control of the his symbiote that was unclear. Spider-Man … is well, still Spider-man, at the end of the day. Spider family fans, and even though a few cool developments do come out of the series, it feels rushed out, poorly plotted, and more of an overall cash grab than story that needed to be told so quickly into Legacy. Other than for art, as a series overall, I just can't put my stamp of approval on it and dont suggest you rush out and try this ... wait until it hits Marvel Unlimited. 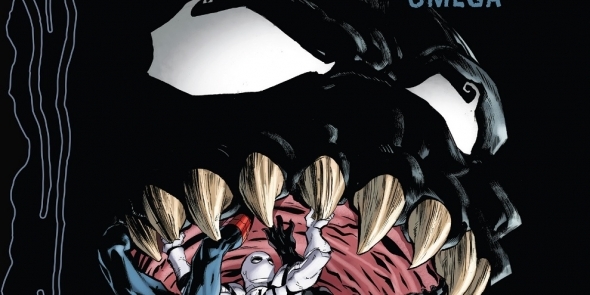 The Venom Inc story comes to a silly and strange conclusion. This whole thing came off more like a Saturday morning Disney XD Spider-Man cartoon than a story you’d find in the pages of a true Amazing Spider-Man book. Other than a glance at the art present throughout the series I don't recommend this crossover and the extra investment it involved. Whole thing was a stinking mess.